By the 1920s, Albert Einstein’s theory of relativity, first published in the 1910s, invalidated Sir Isaac Newton’s version of time as a uniform absolute. Because of this, many artists and writers developed a fascination with the subjective experience of time. In Watch (1925; 1963.75.FA), Gerald Murphy engaged his own preoccupation with time. 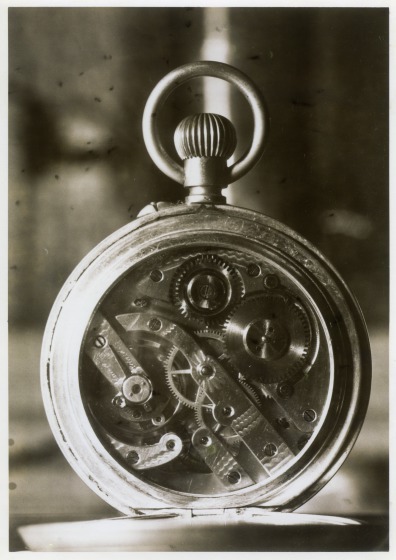 Murphy once expressed that he was, “always struck by the mystery and depth of the interiors of a watch—its multiplicity, variety, and feeling of movement and man’s grasp at perpetuity.” Moreover, Murphy’s father designed the first wristwatch after a British infantry officer told him that the pocket watch he carried was too unwieldy for trench warfare. "Gerald Murphy, Watch," DMA Connect, Dallas Museum of Art, 2012.